These gifts will instantly upgrade any home. Get it from Amazon for $129.90 (available in two colors). And check out our full list of the best chairs you can buy on Amazon. 2. A set of heartwarming elephant shakers so you can sprinkle a little love onto every dish you eat. The ceramic shakers should be hand-washed only. 3. 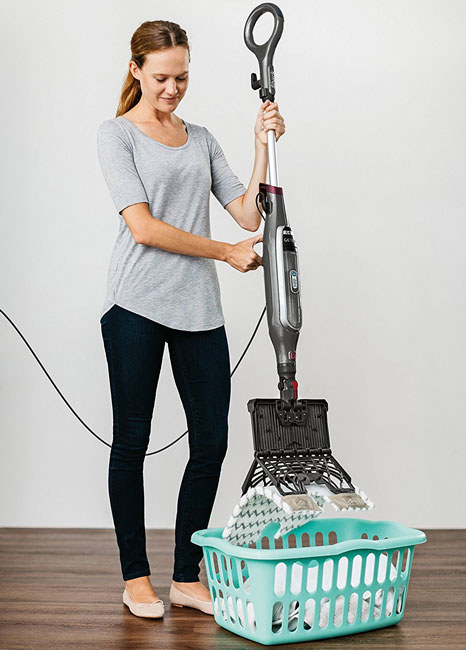 A Shark Genius Steam Pocket Mop System, which'll keep sealed hard floors of all kinds clean, sanitized, and looking like perfection. 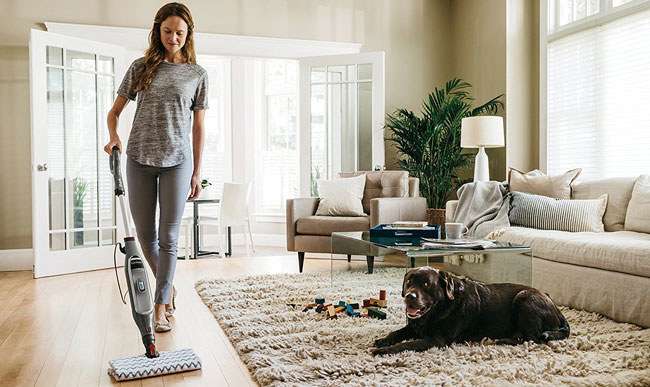 The steam mop uses washable, dual-sided Dirt Grip Pads to clean and sanitize sealed floors. It also features touch-free technology, which allows you to remove dirty pads with the press of a button. Plus, its "Intelligent Steam Control" system allows you to customize your steam levels for specific cleaning tasks. 4. An LED magnifying mirror so you’ll have the best lighting and view to create all your boss makeup looks. 5. A mini artificial plant to treat your space to some adorable greenery without having to worry about keeping the adorable plant alive. The artificial plants come potted in paper pulp planters that should not be placed in water. Get it from Amazon for $8.99+ (available in nine styles). 6. A Squatty Potty so you and your guests' ~alone time~ will be so much more pleasant, possibly making your bathroom the most popular room in your home. Just make sure you have some Poo-Pourri on deck, and all should be good. 7. An adorable porcelain dog lamp that’ll work great as an accent light or night light. Get it from World Market for $23.99. 8. A cool-mist humidifier for adding moisture to the air, which will help to hydrate your skin and hopefully have you sleeping a little better. Plus, it has a night light feature and auto shut-off option, so you don’t have to worry about it running once the water gets low. 9. A mini slow cooker for warming up small portions and making it easier to cook breakfast dishes like oatmeal. Get it from Amazon for $12.79+ (available in three sizes and four colors). 10. An over-the-cabinet hair tools holder to take your bathroom organization to max levels. Get it from Amazon for $12.99 (available in seven finishes). Get it from ModCloth for $39 (available in stegosaurus and T-rex styles). 12. A darling set of metal trunks with rose gold hardware that can be used for storage as well as a chic alternative nightstand or end table. Get it from Amazon for $99.99+ (available in five colors and as a two-piece or three-piece). 13. An awesome outlet shelf perfect to hold small bathroom necessities like an electric toothbrush, clippers, or your phone while you're showering. Get it from Amazon for $9.79 (available in three colors). 14. A Furbo so keeping close watch over your pup — and feeding them yummy treats — will be so much easier while you're away. The camera features 1080p HD video, 168-degree wide-angle views and a night vision camera. It also features two-way audio, and allows you to fling treats to your dog using voice commands. Get it from Furbo for $249. Read more about the Furbo here. 15. A gleaming glass and satin-finished gold coffee table and side table that might tempt you to buy all new furniture to match its gorgeousness. Get them for Walmart: coffee table for $75 (available in two finishes) and the side table for $49. 16. A vibrant set of nonstick cookware that can brighten up your kitchen with all kinds of rainbow-colored amazingness. The 15-piece cookware set includes four pots with matching glass lids, a fry pan, a sauté pan, and five cooking utensils. All the pieces are nonstick. The cookware is oven-safe, but should only be hand-washed. It is also recommended that you hand-wash the cooking utensils. Get the 15-piece set from Amazon for $59.99+ (also available in all-black). 17. A dashing Persian-style area rug you can guarantee will fill your bedroom or living room with pure elegance. The rug features stain-resistant polypropylene fabric, a non-slip rubber back, and a fade-resistant, low-profile surface pile. Get it from Amazon for $23.06+ (available in three colors and nine sizes). 18. A copper-colored string light to hang anywhere in your home you need a little extra magic (and a warm ambient glow). The string light is 66 feet long with a 5-foot power cord. 19. A stylish wood and metal cart with a gold-toned finish you can use as a side table, extra storage space, or as a spot to store all your bar tools and favorite liquor bottles. 20. A comfy Brooklinen sheets bundle to upgrade your linens from basic to badass. Get the seven-piece set from Brooklinen for $187.50+ (available in sizes twin–California king and in 15 sheet and duvet colors). 21. A gorgeous set of champagne flutes so you can sip your bubbly in style. The set includes six dishwasher-safe flutes. Get them from Sur La Table for $65. 22. And a cult-favorite Instant Pot multi-use cooker that brings together seven kitchen appliances into one single pot you and your tasty recipes will love forever. The Instant Pot can be used as a pressure cooker, slow cooker, rice cooker, steamer, sauté, yogurt maker, and warmer. Read a detailed review of the Instant Pot.